In my discussion at AAUP, I focused less on my current work and and more on the trends I see in the marketplace overall. I began my discussion by observing that ‘chunking’ in educational content is inevitable and inexorable. As most publishers will admit, the process has been growing rapidly (often illegally) over the past 20 years but maybe largely uncounted in terms of value. A comparison to the music world before iTunes is always referenced but ‘chunking’ has also been used in newspapers, journals and magazines, television and other media segments for many years. Education is just late to the party. Naturally, during any changing market sometimes the incumbent market participants can be disadvantaged; in education, because the market is so heavily concentrated on four large players, they have the most to lose when faculty and administrators’ decisions about content and pricing attain a broader scope. Rather than choose one textbook and a package of assorted articles and textbook content, a faculty member may now effectively combine the two into a package that specifically matches their class objectives. 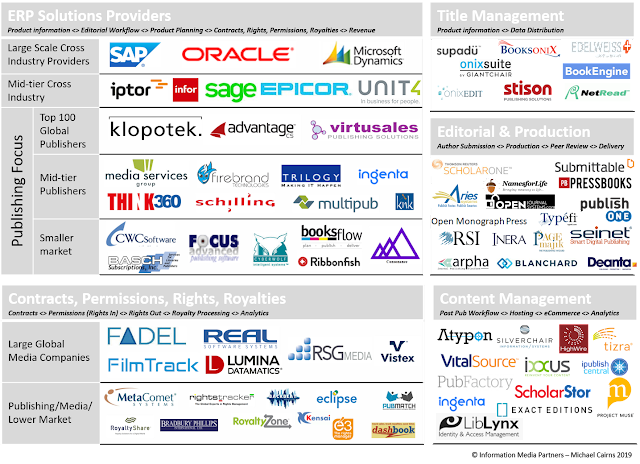 Now, rather than being the primary suppliers of content assigned, once-dominant textbook publishers may suddenly find themselves one source of many. In other media segments, we have seen some price erosion as content has been disaggregated (from album to track, for example) and that is likely to occur in education as well. It’s too early to tell whether this is good or bad but pricing is already a key factor to students, faculty and administrators; it’s easy to see how a faculty member would opt for affordability especially when coupled with greater latitude to choose content. Currently, evidence suggests that 'chunked' prices are consistent with current ‘full book’ content but remains to be seen whether these prices will be pushed downwards in the future. COPE is a concept many in the media industry (and consultants) have been touting for a long time: Create your Content Once but have the ability to Publish it Everywhere. This is compatible with the practice of creating new xml based workflows so you can repurpose your content to fit differing circumstances, without having to rework it or reinvent new production processes. Currently, most of the publishers we work with only have the ability to provide pdf files to us but, as more customers demand disaggregated or ‘chunked’ content, publishers will need to rebuild their workflows. As a consequence, the market will also demand better meta-data to support the sale and distribution of this content and we are seeing publishers start to address both of these challenges. (Note – at this point in my presentation, I referenced the size of the education market and the revenue associated with certain segments and titles using charts from PubTrack). Currently, text-based content is the focus of the custom model in education; however, multi-media (digital) content is often requested, used and produced. At many universities, for example, faculty lectures are recorded and distributed, YouTube is considered an important resource and webchat, web demos and other interactive technologies are used extensively. Importantly, we will begin to see our publishers provide digital elements like these for use by faculty in increasing numbers, and our platform has been built to accommodate the delivery of content in various formats. We will soon be expanding our library accordingly. These content additions will raise the complexity in delivering a solution to faculty that remains easy to use. Given this increased complexity, our challenge will be search and discovery – delivering the precise content requested – for which we will rely on metadata supplied by publishers. We hope publishers appreciate these shared challenges. All-campus (or all-systems) approaches to addressing some of the drivers I note above are becoming more common. At Indiana University (IU), they have established a campus-content platform through which faculty can choose and assign content while providing a consistent experience for students. A key aspect of this implementation is that Indiana has entered into direct agreements with several publishers to host their content (with preferential pricing) on this platform. In theory, the IU students benefit from the university’s negotiating power over the publishers, and many other universities view IU as a leader in this arena because of the way they have approached relations with publishers. There are numerous other examples offering similar approaches to the management of content on campus including programs at MIT, the California State University (CSU) system, an initiative in Minnesota and several others. CSU partnered with Cengage earlier this year and is seeking other similar publisher relationships. In closing my comments at AAUP, I noted some market dynamics that indicate ‘chunking’ is already relevant. In particular, permissions revenues (which have long been considered ‘found-money’) are growing at a far greater rate than overall revenues for many publishers. I heard this repeatedly at AAUP indicating that my prediction that ‘permissions’ revenues will become a primary source of publisher revenues is already taking place. Additionally, the four large education publishers have all beefed up their own custom publishing solutions – which, for the most part, operate as ‘closed-gardens’ – and have seen significant revenue growth because of their investments. (Much of this may be substitution revenue). In the future, I expect all publishers to either have their own custom platform and/or to participate in solutions provided by platform providers such as CoreSource, CourseSmart and VitalSource. We believe the recent Georgia eReserves case gave impetus to digital solutions that can render content easily accessible and reasonably priced and I have seen an uptick in publishers seeking advice on this point. The Georgia case made clear that publisher content is being used in disaggregated form by many educators across universities but, because there has not been a ‘marketplace’ (similar to iTunes), much of this content has been appropriated without due payment to the publisher. Improvements to the clearance and permissions process have helped but the effort to “do-the-right-thing” still remains cumbersome. As a result of this, it seems inevitable that there will be much more competition in providers offering platforms and solutions to publishers that can delivery content that maximizes this opportunity. In conclusion, I hope we can first agree on a different term than ‘chunking’ since this implies that the material doesn’t have uniformity and/or pedagogical veracity of itself. Perhaps because we are currently ‘chunking’ content that has been created as a component (not a stand-alone) and a component then ‘chunking’ may be appropriate now but not for the future. In the future, faculty will want to find and assign (buy) individual items and thus your editorial processes (as a publisher) will need to be re-thought. Often, it is not possible to anticipate how customers will use our products and in a disaggregated world these uses will explode. We must provide them some basic building blocks and tools which, on a very basic level include, re-flowable content, descriptive details and information, metadata and keywords. Some publishers are starting to develop this so don’t be left behind. Thanks for this very informative post. It nicely captures the state of the industry with respect to "chunking". What's odd, though, is that the state of the educational publishing industry has changed so little over the last decade. I was having conversations about these issues a full ten years ago with publishers - as were many others, I'm sure. Educators want a simple plug-and-play source of content. They don't care where the content comes from, as long as they can be sure that it's high quality. In this respect, the (over-used) comparison to iTunes is apt: music consumers don't care which recording company is behind the music, they just want to be sure that they are downloading something that is of sufficient quality (which wasn't always available via Napster and the like). iTunes is a marketplace that guarantees a certain level of quality and ease of use. No such model exists for digital educational content. Publishers are still offering colleges a wide range of overlapping, inconvenient solutions of digital content- each with its' own branding. I know of one publisher that has 5 different solutions for digital content. I'm "in the business" and I have a hard time figuring out the differences; asking lone academics to figure out which one they need is a great way to lose a sale.